Tavares says PSA's partnership with Dongfeng will help the French company to expand in China. 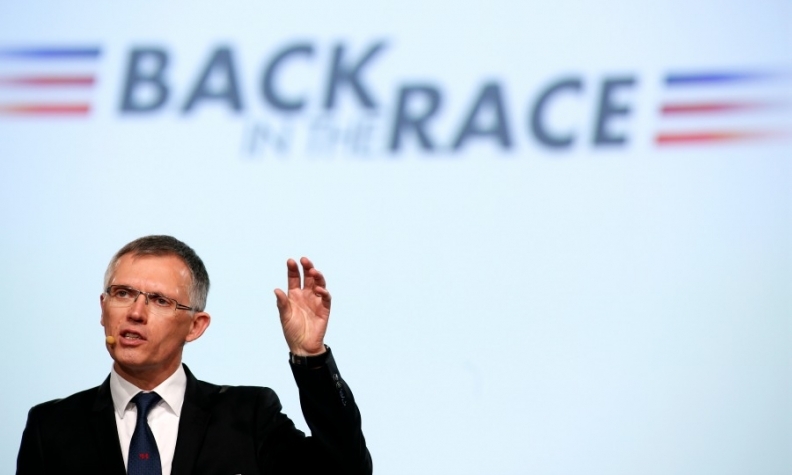 PARIS -- PSA/Peugeot-Citroen will keep its industrial partnerships with General Motors, Toyota and Fiat, CEO Carlos Tavares said as he presented his Back in the Race strategy to turn around the struggling French automaker. The arrival of China's Dongfeng Motor as a 14 percent stakeholder in PSA will not affect the automaker's other alliances, Tavares said here on Monday. Cooperation with GM, Toyota and Fiat to jointly build about 1.25 million vehicles a year basis will enable PSA to save about 100 million euros a year, he said. PSA confirmed that its alliance on diesels with Ford will continue. The two companies are developing new engines that will meet Euro 7 emission rules. Currently, they jointly build 2.3 million diesel engines a year. PSA and GM's Opel brand will build minivans at each other’s factories in France and Spain, although the companies ended plans to build subcompact cars together. Fiat and PSA jointly build commercial vans. PSA said the future of its partnership with BMW on gasoline engines will be decided by the end of the year. Tavares said PSA’s partnership with Dongfeng will help the French company to expand in China and fast-growing southeast Asian markets. "Dongfeng is a great and an enthusiastic partner," he said. Last year, PSA sold 557,000 vehicles in China and Tavares said the plan is to increase annual sales in the country to 970,000 by 2016 and to 1.2 million by 2018. Keeping existing industrial alliances is a key element of Tavares's turnaround plan for PSA, which has been hit hard by the European market slump, reporting cumulative net losses of more than 7.5 billion euros ($10.4 billion) in the past 2 1/2 years. Tavares, 55, became head of PSA at the end of March to guide the company's reorganization. His turnaround plan calls for PSA to reach an operating margin of 2 percent on sales by 2018 from a 3 percent loss last year. The strategy sees PSA reducing its breakeven point to 2 million annual vehicle sales excluding China from the 2.6 million that was its breakeven target in 2013. Last year PSA sold 2.3 million vehicles in its global markets not including 500,000 sales in China, which are not consolidated in PSA's financial results. The 300,000-unit difference between the 2.6 million target and 2.3 million sales was the main reason for a 1.04 billion euros operating loss at PSA’s automotive division in 2013. Tavares will ax unprofitable models "We should stop selling cars at a loss for the sake of covering our fixed costs,” he said. Reduce production costs by 4 percent. Alliances increase economies of scale, thus reducing production costs.